High Noon remains one of Hollywood’s most enduringly popular movies. The term “High Noon” is now part of our everyday language, meaning a “time of a decisive confrontation or contest,” usually between good and evil, in which good is often embodied in a solitary person. High Noon is a fairly simple story, yet filled with tension. The film takes place in the small western town of Hadleyville. Former marshal Will Kane, played by Gary Cooper, is preparing to leave town with his new bride, Amy Fowler, played by Grace Kelly, when he learns that notorious criminal Frank Miller, whom Kane had helped send to jail, has been set free and is arriving with his cronies on the noon train to take revenge on the marshal. Amy, a devout Quaker and a pacifist, urges her husband to leave town before Miller arrives, but Kane’s sense of duty and honor compels him to stay. As he seeks deputies and assistance among the townspeople, Kane is rebuffed at each turn, leaving him alone to face Miller and his gang in a fatal gunfight at the film’s end. High Noon came to the screen in 1952 at the height of Hollywood’s anti-communist campaign, best known for its practice of blacklisting, by which actors, writers, directors, producers, and others in the film industry could be denied employment based upon past or present membership in or sympathy for the American Communist Party. Developed and administered by film industry organizations and luminaries, among them Cecil B. DeMille, John Wayne and future American president Ronald Reagan, blacklisting arose during the early Cold War years as Hollywood’s response to the work of the United States House of Representatives’ Committee on Un-American Activities, better known as HUAC. Until surpassed by Senator Joseph McCarthy, HUAC was the driving force in post World War II America’s campaign to uproot communists and communist sympathizers from all aspects of public life. The Committee exerted pressure on Hollywood personnel with suspected communist ties or sympathies to avoid the blacklist by “cooperating” with the Committee, which entailed in particular “naming names” – identifying other party members or sympathizers. Hollywood blacklisting had all the indicia of what we might today call a “witch hunt.” Blacklisting also came close to curtailing High Noon altogether. 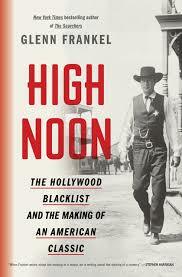 Glenn Frankel’s engrossing, thoroughly-researched High Noon: The Hollywood Blacklist and the Making of An American Classic captures the link between the film classic and Hollywood’s efforts to purge its ranks of present and former communists and sympathizers. Frankel places the anti-communist HUAC investigations and the Hollywood blacklisting campaign within the larger context of a resurgence of American political conservatism after World War II – a “right wing backlash” (p.45) — with the political right struggling to regain the upper hand after twelve years of New Deal politics at home and an alliance with the Soviet Union to defeat Nazi Germany during World War II. There was a feeling then, as today, Frankel explains, that usurpers had stolen the country: “outsiders had taken control of the nation’s civil institutions and culture and were plotting to subvert its security and values” (p.x). The usurpers of the post-World War II era were liberals, Jews and communists, and “self-appointed guardians of American values were determined to claw it back” (p.x). Hollywood, with its “extraordinary high profile” and “abiding role in our national culture and fantasies” (p.xi), was uniquely placed to shape American values and, to many, communists and Jews seemed to be doing an inordinate amount of the shaping. In an industry that employed nearly 30,000 persons, genuine communists in Hollywood probably never exceeded 350, with screenwriters roughly half of the 350. But 175 screenwriters, unless thwarted, could freely produce what right-wing politicians termed “propaganda pictures” designed to undermine American values. Communists constituted a particularly insidious threat because they looked and sounded indistinguishable from others in the industry, yet were “agents of a ruthless foreign power whose declared goal was to destroy the American way of life” (p.x). That a high portion of Hollywood’s communists were Jewish heightened suspicion of the Jews who, from Hollywood’s earliest days as the center of the film industry, had played an outside role as studio heads, screenwriters, and agents. Jews in Hollywood were at once “uniquely powerful” and “uniquely vulnerable” to the attacks of anti-Semites who accused them of “using the movies to undermine traditional American values” (p.13). Frankel’s account of this struggle over security and values involves a multitude of individuals, primarily in Hollywood and secondarily in Washington, but centers upon the interaction between three: Gary Cooper, Stanley Kramer, and Carl Foreman. Cooper was the star of High Noon and Kramer its producer. Foreman wrote the script and was the film’s associate director until his refusal in September 1951 to name names before HUAC forced him to leave High Noon before its completion. Foreman and Kramer, leftist leaning politically, were “fast-talking urban intellectuals from the Jewish ghettos of Chicago [Foreman] and New York [Kramer]” (p.xvi). Foreman had been a member of the American Communist Party as a young adult in the 1930s until sometime in the immediate post-war years; Kramer’s relationship to the party is unclear in Frankel’s account. Cooper was a distinct contrast to Foreman and Kramer in about every respect, a “tall, elegant, and reticent” (p.xvi) Anglo-Saxon Protestant from rural Montana, the product of conservative Republican stock who liked to keep a low profile when it came to politics. Although Cooper was the star of High Noon, Foreman emerges as the star in Frankel’s examination of HUAC investigations and blacklisting. Foreman saw his encounter with HUAC in terms similar to those which Cooper, as Will Kane, encountered in Hadleyville: he was the marshal, HUAC seemed like the gunmen coming to kill the marshal, and the “hypocritical and cowardly citizens of Hadleyville” found their counterparts in the “denizens of Hollywood who stood by passively or betrayed him as the forces of repression bore down” (p.xiii). The filming of High Noon had begun a few days prior to Foreman’s testimony before HUAC and was completed in just 32 days, on what amounted to a shoestring budget of $790,000. How the 84-minute black-and-white film survived Foreman’s departure constitutes a mini-drama within Frankel’s often gripping narrative. In most accounts, Hollywood’s blacklisting practices began in 1947, when ten writers and directors — the “Hollywood Ten” — appeared before HUAC and refused to answer the committee’s questions about their membership in the Communist Party. They were cited for contempt of Congress and served time in prison. After their testimony, a group of studio executives, acting under the aegis of the Association of Motion Picture Producers, fired the ten and issued what came to be known as the Waldorf Statement, which committed the studios to firing anyone with ties to the Communist Party, whether called to testify before HUAC or not. This commitment in practice extended well beyond party members to anyone who refused to “cooperate” with HUAC. Neither Foreman nor Kramer was within HUAC’s sights in 1947. At the time, the two had banded together in the small, independent Stanley Kramer Production Company, specializing in socially relevant films that aimed to attract “war-hardened young audiences who were tired of the slick, superficial entertainments the big Hollywood studios specialized in and [were] hungry for something more meaningful” (p.59). In March 1951, Kramer Production became a sub-part of Columbia Pictures, one of Hollywood’s major studios. 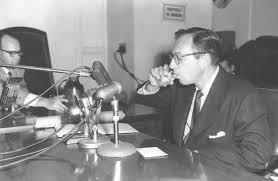 In June of that year, while finishing the script for High Noon, Foreman received his subpoena to testify before HUAC. The subpoena was an “invitation to an inquisition” (p.xii), as Frankel puts it. HUAC, in the words of writer David Halberstam, was a collection of “bigots, racists, reactionaries and sheer buffoons” (p.76). The Committee acted as judge, jury and prosecutor, with little concern for basic civil liberties such as the right of the accused to call witnesses or cross-examine the accuser. Witnesses willing to cooperate with the Committee were required to undergo a “ritual of humiliation and purification” (p.xii), renouncing their membership in the Communist Party and praising the Committee for its devotion to combating the Red plot to destroy America. A “defining part of the process” (p.xiii) entailed identifying other party members or sympathizers – the infamous “naming of names” — which became an end in itself for the HUAC, not merely a means to obtain more information, since the Committee already had the names of most party members and sympathizers working in Hollywood. Forman was brought to the Committee’s attention by Martin Berkeley, an obscure screenwriter and ex-Communist who emerges as one of the book’s more villainous characters — Hollywood’s “champion namer of names” (p.241). Kramer, who had initially been supportive of Foreman, perhaps out of concern that Foreman might name him as one with communist ties, ended by acceding to Columbia Pictures’ position that Foreman was too tainted to continue to work for its subsidiary. Foreman left Kramer Production with a lucrative separation package, more than any other blacklisted screenwriter. His attempt to start his own film production company went nowhere when it became clear that anyone working for the company would be blacklisted. Foreman, a “committed movie guy” who “passionately believed in [films] as the most successful and popular art from ever invented” (p.218), was finished in Hollywood. He and Kramer never spoke again. Kramer had had little direct involvement with the early shooting of High Noon. But after Foreman’s departure, he reviewed the film and was deeply dismayed by what he saw. He responded by making substantial cuts, which he later claimed had “saved” the film. But in Frankel’s account, Cooper rather than Kramer saved High Noon, making the film an unexpected success. Prior to his departure, Foreman had suggested to Cooper, working for a fraction of his normal fee, that he consider withdrawing from High Noon to preserve his reputation. Cooper refused. “You know how I feel about Communism,” Frankel quotes Cooper telling Foreman, “but you’re not a Communist now and anyhow I like you, I think you’re an honest man, and I think you should do what is right” (p.170-71). Kramer and Foreman were initially reluctant to consider Cooper for the lead role in High Noon. At age fifty, he “looked at least ten years too old to play the marshal. And Cooper was exactly the kind of big studio celebrity actor that both men tended to deprecate” (p.150). Yet, Cooper’s “carefully controlled performance,” combining strength and vulnerability, gave not only his character but the entire picture “plausibility, intimacy and human scale” (p.252), Frankel writes. Will Kane is “no superhuman action hero, just an aging, tired man seeking to escape his predicament with his life and his new marriage intact, yet knowing he cannot . . . It is a brave performance, and it is hard to imagine any other actor pulling it off with the same skill and grace” (p.252). None of the “gifted young bucks” whom Kramer and Foreman would likely have preferred for the lead role, such as Marlon Brando, William Holden, or Kirk Douglas, could have done it with “such convincing authenticity, despite all their talent. In High Noon, Gary Cooper is indeed the truth” (p.252). 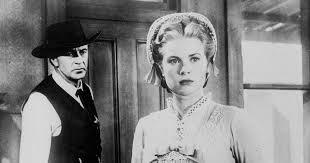 High Noon also established Cooper’s co-star, Grace Kelly, playing Marshal Kane’s new wife Amy in her first major film. Kelly was some 30 years younger than Cooper and many, including Kramer, considered the pairing a mismatch. But she came cheap and the pairing worked. Katy Jurado, a star in her native Mexico, played the other woman in the film, Helen Ramirez, who had been the girlfriend of both Marshal Kane and his adversary Miller. During the film, she is involved romantically with Kane’s feckless deputy, Harvey Pell, played by Lloyd Bridges. High Noon was only Jurado’s second American film, but she was perfect in the role of a sultry Mexican woman. By design, Foreman created a dichotomy between the film’s male hero — a man of “standard masculine characteristics, inarticulate, stubborn, adept at and reliant on gun violence” (p.253) — and its two women characters who do not fit the conventional models that Western films usually impose on female characters. The film’s “sensitive focus on Helen and Amy – remarkable for its era and genre – is one of the elements that make it an extraordinary movie” (p.255), Frankel contends. Frankel pays almost as much attention to the movie’s stirring theme song, “Do Not Forsake Me, Oh My Darling,” sung by Tex Ritter, as he does to the film’s characters. The musical score was primarily the work of Dimitri Tiomkin, a Jewish immigrant from the Ukraine, with lyricist Ned Washington providing the words. The pair produced a song that could be “sung, whistled, and played by the orchestra all the way through the film, an innovative approach that had rarely been used in movies before ” (p.230). Ritter’s raspy voice proved ideally suited to the song’s role of building tension in the film (the better known Frankie Laine had a “more synthetic and melodramatic” (p.234) version that surpassed Ritter’s in sales). The song’s narrator is Kane himself, addressing his new bride and expressing his fears and longings in music. The song, whose melody is played at least 12 times during the movie, encapsulates the plot while explaining the marshal’s “inner conflict in a way that he himself cannot articulate” (p.232). Its repetition throughout the film reminds us that Kane’s life and happiness are “on the line, yet he cannot walk away from his duty” (p.250). Frankel also dwells on the use of clocks in the film to heighten tension as 12:00 o’clock, High Noon, approaches. The clocks, which become bigger as the film progresses, “constantly remind us that time is running out for our hero. They help build and underscore the tension and anxiety of his fruitless search for support. There are no dissolves in High Noon – none of the usual fade-ins and fade-outs connoting the unseen passage of time – because time passes directly in front of us. Every minute counts – and is counted” (p.250). High Noon was an instant success from the time it came out in the summer of 1952, an “austere and unusual piece of entertainment,” as Frankel describes the film, “modest, terse, almost dour . . . with no grand vistas, no cattle drives, and no Indian attacks, in fact no gunplay whatsoever until its final showdown. Yet its taut, powerful storytelling, gritty visual beauty, suspenseful use of time, evocative music, and understated ensemble acting made it enormously compelling” (p.249). But the film was less popular with critics, many of whom considered the film overly dramatic and corny. The consensus among the cognoscenti was that the film was “just barely disguised social drama using a Western setting and costumes,” as one critic put it, the “favorite Western for people who hate Westerns” (p.256). John Wayne argued that Marshal Kane’s pleas for help made him look weak. Moreover, Wayne didn’t like the negative portrayal of the church people, which he saw it as an attack on American values. The American Legion also attacked the film on the ground that it was infected by the input of communists and communist sympathizers. After leaving the High Noon set, Foreman spent much of the 1950s in London, where he had limited success in the British film industry while his marriage unraveled. For a while, he lost his American passport, pursuant to State Department policy of denying passports to anyone it had reason to suspect was Communist or Communist-leaning, making him a man without a country until a court overturned State Department policy. Kramer left Columbia pictures after High Noon. He went back to being an independent producer and in that capacity established a reputation as Hollywood’s most consistently liberal filmmaker. To this day, the families of Foreman and Kramer, who died in 1984 and 2001, respectively, continue to spar over which of the two deserves more credit for High Noon’s success. Cooper continued to make films after High Noon, most of them westerns of middling quality, “playing the same role over and over” (p.289) as he aged and his mobility grew more restricted. He kept in touch with Foreman up until his death from prostate cancer in 1961. Frankel returns at the end of his work to Foreman’s view of High Noon as an allegory for the Hollywood blacklisting process — a single man seeking to preserve honor and confront evil alone when everyone around him wants to cut and run. But, Frankel argues, seen on the screen at a distance of more than sixty years, the film’s politics are “almost illegible.” Some critics, he notes, have suggested that Kane, rather than being a brave opponent of the blacklist, could “just as readily be seen as Senator Joseph McCarthy bravely taking on the evil forces of Communism while exposing the cowardice and hypocrisy of the Washington establishment” (p.259). Sometimes a good movie is just a good movie.